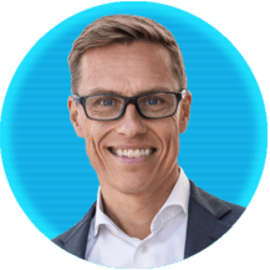 Alexander Stubb is Vice-President of the European Investment Bank since August 2017. His oversights include the Bank’s financing activities in the Nordics, Baltics and a number of Eastern European countries;   Funding & Treasury; EU Multiannual Financial Framework; Security & Defence; Corporate Responsibility; Gender Equality and Diversity & Inclusion. Alex Stubb served as Prime Minister, Finance Minister, Foreign Minister, Trade and Europe Minister of Finland. His background is in academia and civil service, with a focus on EU affairs. He was a member of the European Parliament from 2004-2008, a government minister from 2008-16, a member of parliament from 2011-2017 and chairman of the National Coalition Party from 2014-16. He holds a PhD from the London School of Economics, has published 18 books and is a self-professed sports fanatic.